Great Smoky Mountains National Park neighbors several small towns which provide attractions, lodging, restaurants, and unique shopping opportunities for the many tourists visiting the Smoky Mountain area. 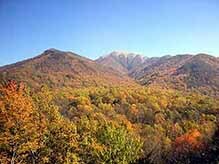 Enjoy Tennessee's beautiful Smoky Mountains in the Fall. 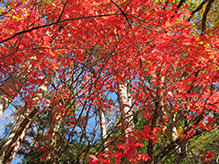 Fall foliage viewing begins around the first of October and continues through the second week in November. 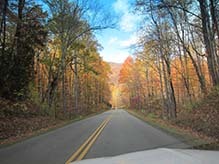 Whether driving in the comfort of your car or hiking to get closer to nature, there are trails for all to enjoy the colorful Fall foliage throughout the Great Smoky Mountains. Looking for brilliant reds, gold, yellow, orange and brown? You will find it seeing yellow birch, American beech, mountain maple, hobblebush and pin cherry among 100 species of native trees here. With over 10 millions visitors each year, it's clear why this land is for those who love the outdoors. 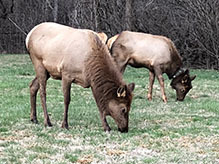 Elk can be viewed grazing or resting in the fields near Oconaluftee Visitor Center on the Cherokee side of Great Smoky Mountains National Park or in the Cataloochee Valley on the Maggie Valley side of the Park. The Oconaluftee Visitor Center is located on Hwy 321 (Newfound Gap Rd), just 1/2 mile from Cherokee. When viewing elk, please keep a distance of 50 yards. Please do not approach the elk or feed them. 4. Clingman's Dome, which is 6,643 feet and the highest point in the Great Smoky Mountains National Park, is the highest point in Tennessee and the third highest mountain east of the Mississippi. From its observation tower on the summit you can have a 360 degree view of the Smokies and beyond this has a steep half-mile walk to the tower. 5. Don't forget the scenery at Ramsey Cascades. Being the highest waterfall in the Smokies, it follows rushing rivers and streams for most of its length. 6. The Mountain Farm Museum is a unique collection of farm buildings assembled from locations throughout the park. Visitors can go into a log farmhouse, barn, apple house, springhouse, and a working blacksmith shop to feel how it felt to live there 100 years ago. Most of the structures were built in the late 19th century and were moved here in the 1950s. The Davis House offers a unique chance to view a log house built from chestnut wood before the chestnut blight destroyed most of the American Chestnut in the eastern United States during the 1930s and early 1940s. Gatlinburg offers old fashioned hayrides through the streets of downtown Gatlinburg. 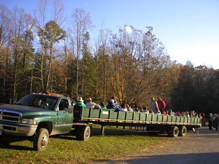 As fall begins in the Smoky Mountains, take this fun filled hayride and enjoy breath taking views of our beautiful mountain foliage. Departure is at traffic light #6 at the Mountain Mall. Rides leave approximately every 45 minutes, November 1 - December 31. Call 865-436-3897 for more information. Cades Cove Riding Stables offers a 1.5 – 2 hour hayride around the Cades Cove Loop Road. Passengers sit on a bed of hay in a trailer pulled by a truck and enjoy an open air view of the scenery of Cades Cove. 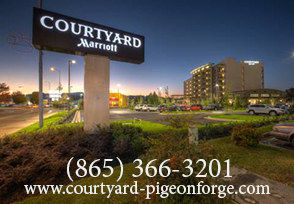 Reservations are generally required and can be made by calling (865) 448-9009. Apple Valley Riding Stables has a hayride drawn by a tractor while riding on an old wooden hay wagon. 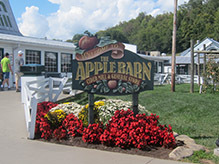 At Baxter's Orchard in Cosby, TN you can pick every type of apple you could want; Golden Delicious, Red Delicious, Milam, Staymen Winesap, York, Rome Beauty, Granny Smith, Jonathon. Get all you can then take home and make apple crisps, caramel apples, apple pie or anything else apple that makes your taste buds soar. Baxter's also has pumpkins. Open: Early September to late November; Mondays - Sundays, 8:00am-6:00pm. 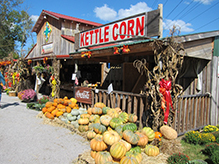 From Townsend to Gatlinburg there is a Fall festival that will meet your needs. 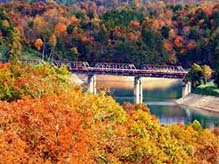 There's the Smoky Mountain Harvest festival which is a county wide celebration that includes craft shows, decorating contests, Smoky Mountain Harvest Festival, Fall Grand Rod Run, Dumplin Valley Bluegrass, Rotary Club Crafts Festival, just to name a few. 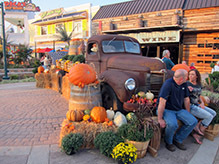 The Gatlinburg Craftsmen's Fair is one of the largest fall festivals. Over 200 Craftspeople from around the country assemble to exhibit their historic trades at the Gatlinburg Convention Center. This is an event that consistently attracts the country's finest artists and craft people. One of the items that makes the Gatlinburg Craftsmen's Fair so unique is the fact that the artists not only make their art available for viewing and sale, but they also demonstrate their special talents and skills. There are a number of great golf courses to play in the Smokies. Enjoy playing at scenic beauty, four-season climate courses while enjoying the views of the Great Smoky Mountains -- from scenic to Championship courses. Bent Creek Golf Course, designed by three time Masters and British Open Championship Winner Gary Player, is a par 72 course. The front nine hugs the valley floor while the back nine offers a challenging mountain course. A beautiful sparkling mountain stream meanders throughout the entire course. Gatlinburg Golf Course offers the well-seasoned golfer as well as the beginner a challenge on every hole, while its scenic beauty is unsurpassed. The course has been acclaimed as one of the most picturesque courses in America with breathtaking views of the Great Smoky Mountains. Laurel Valley Golf Course offers beautiful mountain views, an abundance of wildlife, laser leveled tee boxes, and challenging undulating greens. Sitting around the fireplace in a cozy cabin nestled deep in the heart of the Smokies – Would you rather have economy cabins or lavish ones? The Smokies has them all. 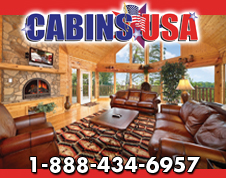 From Jacuzzis, rock climbing walls, to romantic hideaways on the lake or in the woods you can find your dream cabin. Bring your camera, your painting canvas, or a good book, and you can relax and unwind with great views of nature. You won't have a shortage of things to do if you want to get out as well. Find a Cozy Cabin for your Smoky Mountain Fall Adventure! 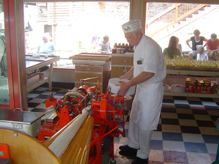 This place makes taffy as you watch through the front window of the store or inside. Going inside is a must with caramel apples, chocolate bears on a stick and turtles that taste as good as they look. The fudge is homemade and hand stirred with huge wooden paddles in copper pots; no matter what kind you get, it's mouth watering. This candy kitchen also gives out taffy samples. There are two locations in downtown Gatlinburg. The Candy Kitchen is so popular, even the bears make themselves at home at times. 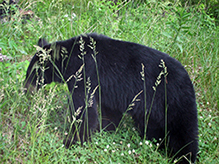 Clearly you can enjoy a variety of wildlife in Great Smoky Mountains National Park, Cades Cove, Cataloochee and surrounding areas. 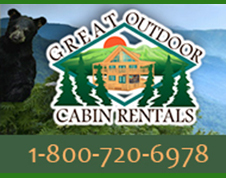 You will see black bears, white tailed deer, elk, wild turkey, fox and even barn owls. To enjoy them up a little closer there is Briarwood Ranch Safari Park (taking a 4 mile safari with animals from 6 continents), Deer Farm Exotic Petting Zoo (pet and feed the animals from reindeer to kangaroos), Dinosaur Walk Museum, Parrot Mountain (tropical birds from all over the world), Rainforest Adventures Discovery Zoo (over 400 live animals), and Ripley's Aquarium of the Smokies (with over 10,000 exotic sea creatures). When you spot wildlife in the National Park, please pull to the side of the road to allow other vehicles to pass and to allow traffic to flow smoothly. Most visitors understand that feeding wildlife is against the law, but many people do not realize that disturbing park wildlife is also a violation of federal regulations and can result in fines and arrest. The laws protecting park wildlife are contained in the Code of Federal Regulations. It states that “Willfully approaching within 50 yards (150 feet), or any distance that disturbs or displaces bear or elk is prohibited." In addition, feeding, touching, teasing, frightening, or intentionally disturbing wildlife is prohibited. As a rule of thumb, if you approach an animal so closely that it changes its behavior, you have approached too closely. Instead use binoculars, spotting scopes, and cameras with telephoto lenses to enjoy wildlife. Watch for any modification in an animal's behavior that indicates that you have approached too closely. Move away from the animal until you reach a distance at which the animal feels comfortable once again and resumes whatever activity it was engaged in before you approached. This is a classy, but casual cafe and dessert shop featuring homemade foods and desserts. 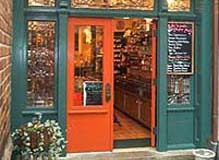 Coffee & Company is Gatlinburg's premier gourmet coffee shop and bean supplier for the serious java connoisseur. They offer more than 20 straights and blends, including organic and fair trade offerings. Large selection of gourmet flavored coffee. There are over 50 different varieties of coffee altogether. Coffee and Company is located in The Village shopping plaza in downtown Gatlinburg. You can bring your own bike or rent one of theirs to ride through the Cove. This trail is for part time bikers as well as people that bike as a sport with an 11 mile loop to enjoy the beauty, wildlife and historical buildings. Don't let the 11 mile loop deter you, though. There is a cut across to shorten the journey, and either trail is worth it. From May 5 - September 22, 2010, the loop road is closed to motor vehicle traffic on Wednesday and Saturday mornings until 10:00 a.m. to allow bicyclists and pedestrians to enjoy the cove. 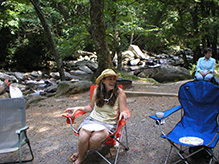 Have a picnic alongside a mountain river. Bring your own food or stop in a nearby town and pick up a prepared picnic. The memories you can make here will last a lifetime and more. Sliding off the rocks into the water, sitting back relaxing, just taking in the scenery, or going for a walk, it's peaceful, beautiful and fun. With 53 miles of track, 2 tunnels and 25 bridges, the Great Smoky Mountains Railroad offers a variety of excursions that explore the amazing landscape of Western North Carolina. With the romance and mystique of an era gone by, guests on-board the Great Smoky Mountains Railroad will enjoy scenic train journeys across fertile valleys and through river gorges in a spectacular region near The Great Smoky Mountains. This section of Western North Carolina offers a wide array of ever changing vegetation and fantastic landscapes. First Class passengers ride in comfort and style in 1940's era bar, lounge and dining cars that feature seating at well-appointed tables and lounge/restaurant style chairs. You will find a number of beautiful driving trails in the National Park. You will find a complete list here. Be sure to bring your camera because you will see gorgeous mountain vistas, wildlife (possibly a bear or two), rivers, waterfalls, and historic structures. Try to schedule your driving tour to coincide with a sunrise or sunset. You can find the times here. You will also discover hiking trails along your way. Trails will be from moderate to strenuous. From history to just plain fun, there are 17 museums to choose from. Carbo's Police Museum over 5,000 police items and not just from the USA. Dinosaur Walk Museum has life-size sculptures to enjoy and a tiny 12" tall Micro raptor. If you're an Elvis fan, you'll enjoy Elvis Museum & Gift Shops and get to see his last limousine (a 1973 stretch Lincoln Continental) among other Elvis memorabilia. Floyd Garrett's Muscle Car Museum has one of the nation's largest most incredible collection of American muscle cars. Great Smoky Mountains Heritage Center you can go back in time seeing 5,000 years of Native American Life in Townsend and Tuckaleechee Cove. Guinness World Record Museum is exciting seeing their feats, facts and records in a great display of fun. For the was enthusiasts there is Hollywood Wax Museum which has some of the world's most famous stars, and it's open until midnight every day of the year. These are just to name a few. 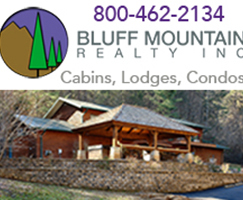 Either riding 7,000 acres of mountain trails and streams on an ATV or touring the Smokies by renting a car, jeep, or Hummer, adventure is waiting for you at Bluff Mountain Adventures in Pigeon Forge. 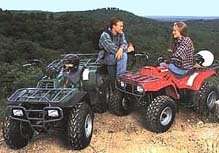 There are also ATV rentals in Townsend. ATV rides offered are an introductory ride, a mountain trail adventure ride, and a custom ride which is only for the daring. The mountain trail adventure ride is idea for those who want to tour the mountain, cross mountain streams, and ride to the top of Bluff Mountain at 2,300 feet for a spectacular scenic Fall view. A ridge run ride is a mountain challenge! Ride a 4x4 Yamaha Kodiak and experience the mountains as never before. Sit back and let a trolley take you throughout parts of the National Park and nearby Gatlinburg. 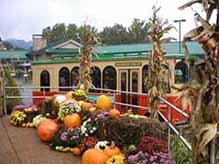 You can even take a trolley to Dollywood’s Fall Harvest Festival. 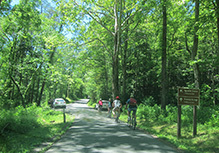 The Orange route will take you from Historic Nature Trail Rd in downtown Gatlinburg to the Gatlinburg Community Center. To make the craft tour loop on Buckhorn and Glades Roads into the Great Smoky Arts and Crafts Community, take the Yellow Route. Make a loop from the Welcome Center on the Spur, up the Parkway and onto River Road to Ski Mountain Road by taking the Green Route. The Red route will take you to Dollywood. The Tan route runs through October from traffic light #6 in Gatlinburg and takes you down Little River Road to Sugarlands Visitor Center in Great Smoky Mountains National Park, on to Laurel Falls parking lot and Elkmont Campground, returning to the trolley stop at traffic light #6. This trip takes approximately 1-1/2 hours, round trip. 1. Tuckaleechee Caverns a.k.a. "Greatest Site Under the Smokies" is one of the earth's oldest mountain chains dating over 20 and 30 million years (located in Townsend). 2. 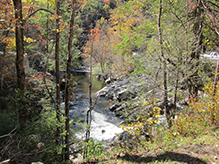 Artisans have an 8-mile loop designated as Tennessee Heritage Arts & Crafts Trail. Established in 1937, it's the largest group of independent artisans in North American. Every arts and crafts lover should be in an arts and crafts heaven. 3. 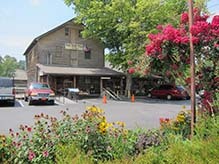 Going back to 1830 you can visit Old Mill & General Store in Pigeon Forge; it's a national treasure that is listed in the National Register of Historical Places. The working mill is over 170 years old. 4. 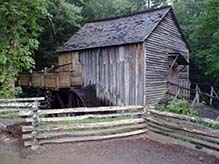 Historic Structures in Great Smoky Mountains National Park - from grist mills to historic cabins. 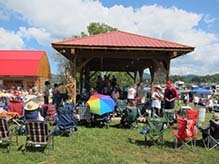 Fall in Wears Valley is all about a harvest festival, pit bbq grills, beautiful open fields with a mountain backdrop, pumpkins, fall decor, and the aroma of country cooking coming from the many great mom and pop restaurants located along Wears Valley Road. The Wears Valley Pumpkin Festival is a simple event, but one you won't want to miss. The Autumn leaves are turning their rich colors of red, orange, and yellow in Wears Valley located just outside Great Smoky Mountains National Park. Fall in Wears Valleyis a time for harvest, rewards of hard work, enjoying crisp cool air, frosty mornings, hot apple cider on a cool night, and the majesty of the Great Smoky Mountains. 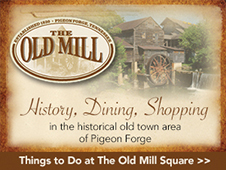 Located in the center of Pigeon Forge is Old Mill Square with its historic Old Mill and numerous unique shops and restaurants. 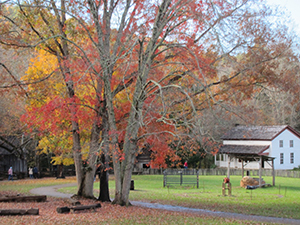 The Square sits on the Little Pigeon River and offers something of interest to all age groups and likes, including a fall crafts festival. You will find a pottery store where you can watch as craftsmen spin pottery and Ole Forge Distillery where you can purchase genuine Smoky Mountain moonshine. Many shops offer a great variety of unique goods. The Old Mill Restaurant serves up some of the finest mountain cooking you will find in the South and The Pottery House Cafe is a must for your dining experience in the Smoky Mountains. Plan to spend a few hours in the Square taking in all the sights and sounds. The Apple Barn Cider Mill & General Store in Sevierville -- It really is a barn that was built in 1910 and has over 4,000 apple trees. There is the Cider Room, Apple Pie Kitchen, Candy Factory, The Creamery, Applewood Farmhouse Restaurant, Apple Barn Winery and The Applewood Farmhouse Grill having something for the whole family. From apple fritters with apple butter that melt in your mouth, apple cobbler, apple cake and applewood chicken salad croissant they serve breakfast, lunch and dinner. What a way to enjoy the beauty of fall foliage than on a zip line in the Smoky Mountains! You'll find ziplines in Pigeon Forge, Gatlinburg, Townsend, and Sevierville. 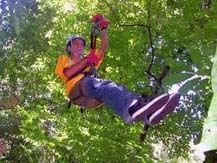 Flying through the trees at up to 40 miles per hour is an exhilarating experience you'll never forget. Ziplines is the fastest growing attraction in the Great Smoky Mountains, where awe inspiring panoramic views meet heart-pounding excitement! Have you ever wondered what the treetops looked like from the same view that birds and squirrels have? The amazing expanse of branches, the lushness of the leaves as they wave in the wind. What would you give to soar through the forest the same way that a gliding blue jay does? Ride the Sky Wheel, enjoy watching the kids have fun on kiddie rides, do some shopping, and more. 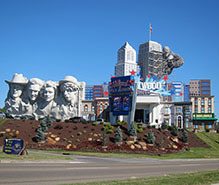 The Island in Pigeon Forge offer lots of things to do for all ages. You'll find tasty meals at lots of eateries, shops galore, an art gallery, a general store, several bars, and even a hotel. The water fountains located in the center of the Island provide water shows frequently throughout the day. 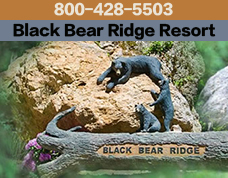 Throughout the Smokies you may be enticed from your car by the sight, sound, and feel of clear, cool mountain streams that tumble downslope as frothy cascades and waterfalls. You may enjoy hiking to a waterfall or just listening quietly to a stream and observing the plants and animals that live in these cool waters. At any time of year, streams are inviting. Water splashing over mossy rocks seems to evoke a response in people, as though they were drawn to it by some ancient instinctive attraction. The mountain river shown in the image to your left is located at The Sinks which is located on Little River Road, approximately 13 miles from Gatlinburg TN and about 5 miles from Townsend, TN. Follow Image Builders's board It's Fall on Pinterest.